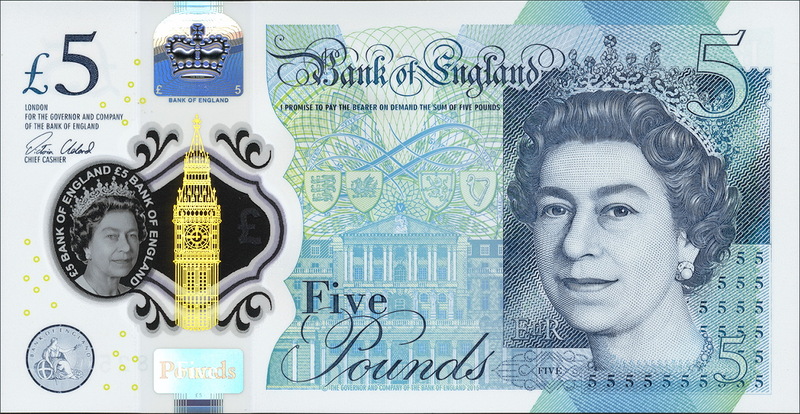 The new polymer £5 note was issued on 13 September 2016. The note features Sir Winston Churchill and is 125 mm x 65 mm. The current paper £5 note features Elizabeth Fry and is 135 mm x 70 mm. The paper £5 will be withdrawn from circulation on 5 May 2017. Obverse: Portrait of Her Majesty Queen Elizabeth II at right. On patterned background is a building of Bank of England. Above the building are 4 coat of arms - left to right - England, Wales, Scotland and Northern Ireland. Seated Britannia as logo of Bank of England at lower left corner. Denominations in numerals are in top corners. In center in words. Many denominations in numerals are in lower right corner. Signature: Victoria Mary Florence Cleland, Chief Cashier of the Bank of England. On the front side of the banknote, in gold color (on the reverse in a silver color), next to a portrait of the Queen is the Big Ben. The clock on the Big Ben shows 15:00 (on the front side, in mirror image, it seems that the clock shows 21:00) - refer to the reverse, in a silver color. Reverse: Portrait of Sir Winston Churchill (1874 – 1965) was one of the greatest statesmen of all time and is the only Prime Minister to win the Nobel Prize for literature (Winston Churchill 1941 photo by Yousuf Karsh). Left of Sir Winston Churchill is The Palace of Westminster. In this image, on a banknote, Big Ben shows 15.00 - the approximate time Sir Winston Churchill pronounced his speech to parliament, on 13 May 1940. The banknote carries a famous Churchill quote from this speech, in which he said: "I have nothing to offer but blood, toil, tears and sweat". Above Westminster palace is the reverse of the Nobel Prize Medal for Literature, which was granted to Sir Winston Churchill, who apart from being a politician was a prolific historical writer, in 1953. On the top, left of center, is a hologram image of Marlborough Maze at Blenheim Palace, birthplace of Sir Winston Churchill. Denominations in numerals are on top, repeated 3 times. In lower left corner in words. Printer: Bank of England print works, Loughton (Debden), Essex, United Kingdom. The polymer for the New Fiver is made by "Innovia Securities", who have a plant in Wigton, Cumbria. See-through window: There is a large see-through window on the note. A clearly defined portrait of the Queen is printed on the window with the words ‘£5 Bank of England’ printed twice around the edge. A finely detailed metallic image of the Elizabeth Tower is positioned over the window. The foil is gold on the front of the note and silver on the back of the note. When the note is tilted a multi-coloured rainbow effect can be seen. Around the edge of the window is a coloured border which changes from purple to green when the note is tilted. The £ symbol in the window also changes from purple to green. This effect can be seen on the front and back of the note. The foil patches: On the front of the note, below the see-through window, is a silver foil patch. When the note is tilted the word ‘Five’ changes to ‘Pounds’ and a multi-coloured rainbow effect can be seen. The polymer and the raised print: The note is printed on polymer which is a thin and flexible plastic material. By running your finger across the front of the note you can feel raised print in areas such as the words ‘Bank of England’ and in the bottom right corner, around the number 5. The print quality: The printed lines and colours on the note are sharp, clear and free from smudges or blurred edges. The microlettering: Using a magnifying glass, look closely at the lettering beneath the Queen’s portrait– you will see the value of the note written in small letters and numbers. The ultra-violet feature: If you look at the front of the note under a good quality ultraviolet light, the number 5 appears in bright red and green whilst the background remains dull in contrast. Winston Churchill was one of the greatest statesmen of all time and is the only Prime Minister to win the Nobel Prize for literature. As he himself said, a "nation that forgets its past has no future". Our banknotes are repositories of the United Kingdom’s collective memory and are testaments to the outstanding achievements of the nation’s greatest individuals. Like Churchill, the new polymer note will also stand the test of time. It is cleaner, being more resistant to dirt and moisture. It is safer, with better security features. And it is stronger, making it longer lasting and more environmentally friendly. Polymer notes are cleaner, more secure and last longer than paper notes. They will provide enhanced counterfeit resilience, and increase the quality of notes in circulation. Cleaner: Polymer notes are resistant to dirt and moisture so stay cleaner far longer than paper notes. Safer: Polymer notes use enhanced security features to make them harder to counterfeit. Stronger: Though polymer notes are not indestructible, they can withstand more wear and tear than their paper counterparts and are expected to last at least 2.5 times longer. Sir Winston Leonard Spencer-Churchill (30 November 1874 – 24 January 1965) was a British statesman, army officer, and writer. He served as Prime Minister of the United Kingdom from 1940 to 1945 and again from 1951 to 1955. As a Member of Parliament (MP), he represented five constituencies over the course of his career. As Prime Minister, Churchill led Britain to victory during World War II. He led the Conservative Party for fifteen years from 1940 to 1955. Churchill was born into an aristocratic family, the son of an English politician and American socialite. Joining the British Army, he saw action in British India, the Anglo–Sudan War, and the Second Boer War, gaining fame as a war correspondent and writing books about his campaigns. Moving into politics, before the First World War, he served as President of the Board of Trade, Home Secretary, and First Lord of the Admiralty as part of Asquith's Liberal government. During the war, Churchill departed from government following the disastrous Gallipoli Campaign. He briefly resumed active army service on the Western Front as commander in the Royal Scots Fusiliers. He returned to government under Lloyd George as Minister of Munitions, Secretary of State for War, Secretary of State for Air, then Secretary of State for the Colonies. After two years out of Parliament, he served as Chancellor of the Exchequer in Baldwin's Conservative government of 1924–1929, controversially returning the pound sterling in 1925 to the gold standard at its pre-war parity, a move widely seen as creating deflationary pressure on the UK economy. Out of office during the 1930s, Churchill took the lead in warning about Nazi Germany and in campaigning for rearmament. At the outbreak of the Second World War, he was again appointed First Lord of the Admiralty. Following Neville Chamberlain's resignation in May 1940, Churchill became Prime Minister. His speeches and radio broadcasts helped inspire British resistance, especially during the difficult days of 1940–41 when the British Commonwealth and Empire stood almost alone in its active opposition to Adolf Hitler. He led Britain as Prime Minister until after the German surrender in 1945. After the Conservative Party's defeat in the 1945 general election, he became Leader of the Opposition to the Labour Government. He publicly warned of an "Iron Curtain" of Soviet influence in Europe and promoted European unity. He was re-elected Prime Minister in the 1951 election. His second term was preoccupied by foreign affairs, including the Malayan Emergency, Mau Mau Uprising, Korean War, and a UK-backed Iranian coup. Domestically his government laid great emphasis on house-building. Churchill suffered a serious stroke in 1953 and retired as Prime Minister in 1955, although remained an MP until 1964. Upon his death, he was given a state funeral. Named the Greatest Briton of all time in a 2002 poll, Churchill is among the most influential people in British history, consistently ranking well in opinion polls of Prime Ministers of the United Kingdom. As a writer, he won the Nobel Prize in Literature in 1953 for his overall, lifetime body of work. His highly complex legacy continues to stimulate intense debate amongst writers and historians. The phrase "blood, toil, tears and sweat" became famous in a speech given by Winston Churchill to the House of Commons of the Parliament of the United Kingdom on 13 May 1940. This was Churchill's first speech on 13 May 1940 to the House of Commons after having been offered the King's commission the previous Friday, to become Prime Minister of the United Kingdom in the first year of World War II. Churchill had replaced Neville Chamberlain on 10 May, and in this speech he asked the House to declare its confidence in his Government. The motion passed unanimously. This was the first of three speeches which he gave during the period of the Battle of France, which commenced on 10 May. Churchill had used similar phrases earlier, as "Their sweat, their tears, their blood" in 1931 and "new structures of national life erected upon blood, sweat, and tears". Churchill's sentence, "I have nothing to offer but blood, toil, tears, and sweat," has been called a paraphrase of one uttered on 2 July 1849 by Giuseppe Garibaldi when rallying his revolutionary forces in Rome: "I offer hunger, thirst, forced marches, battle, and death." As a young man, Churchill had considered writing a biography of Garibaldi. Theodore Roosevelt uttered a phrase similar to Churchill's in an address to the Naval War College on 2 June 1897, following his appointment as Assistant Secretary of the Navy: "Every man among us is more fit to meet the duties and responsibilities of citizenship because of the perils over which, in the past, the nation has triumphed; because of the blood and sweat and tears, the labor and the anguish, through which, in the days that have gone, our forefathers moved on to triumph." Churchill's line has been called a "direct quotation" from Roosevelt's speech. Churchill, a keen soldier, was likely to have read works by Theodore Roosevelt, who was a widely published military historian; it is also possible he read the speech after being appointed First Lord of the Admiralty, a position similar to Roosevelt's. Other versions of the phrase are "It [poetry] is forged slowly and painfully, link by link, with blood and sweat and tears" (Lord Alfred Douglas, 1919), "Blood, sweat, and tear-wrung millions" (Lord Byron, 1823), and "...mollifie/ It with thy teares, or sweat, or blood" (John Donne, 1611). In Latin, Cicero and Livy had used the phrase "sweat and blood". Churchill had not been the preferred choice of most Conservatives to succeed Chamberlain, but the motion on 13 May "That this House welcomes the formation of a Government representing the united and inflexible resolve of the nation to prosecute the war with Germany to a victorious conclusion" passed unanimously. He had been unpopular in many circles since the 1930s and MPs had ignored or heckled his speeches denouncing the prime minister's appeasement policy toward Germany; even others who opposed Chamberlain avoided him. One historian has described the speech's effect on Parliament, however, as "electrifying ... He was still speaking at the House of Commons, but it was now listening, and cheering." (However, Churchill himself subsequently held that many Conservative MPs had still regarded him with reserve and it was not until his speech of 4 July 1940 announcing British action against the French fleet at Mers-el-Kebir that he could feel he had the full support of the whole House) Other great speeches followed, including the "We shall fight on the beaches" speech of 4 June and the "This was their finest hour" speech of 18 June, and were a great inspiration and unifying force to Britain after its defeats in the first year of the war. 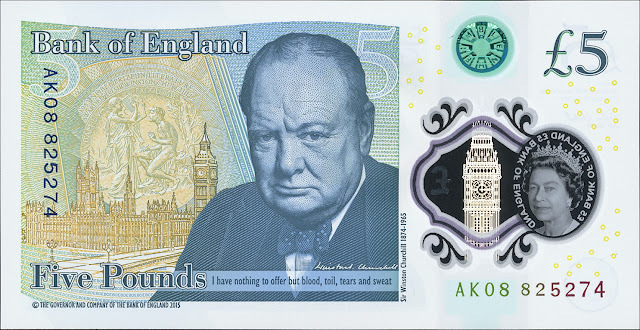 On 26 April 2013, the Bank of England announced that beneath a portrait of Churchill the phrase "I have nothing to offer but blood, toil, tears and sweat." was to adorn the new 5 pound note. It was issued in September 2016. The photo was taken by one of the most famous portrait photographers, Yousef Karsh–known as Karsh of Ottawa–on 30 December, 1941, after Churchill gave a speech to Canadian House of Commons in Ottawa. 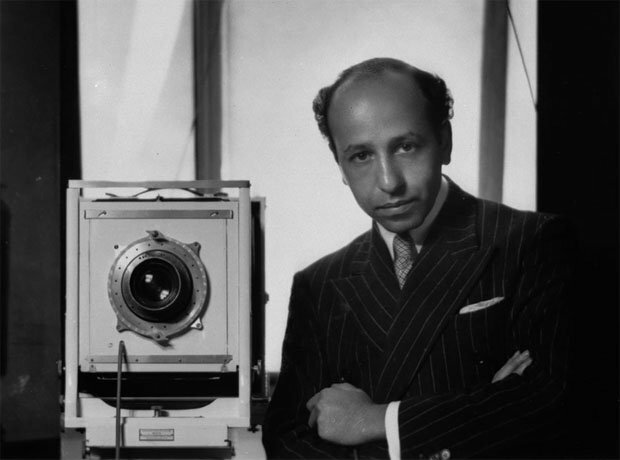 When Karsh took the iconic photo—the one that would grace the cover of Life magazine and launch his international career — he was a young man, excited but nervous about photographing the historic figure. MacKenzie King, former prime minister of Canada, had first noticed Yousuf when he was photographing a meeting with Franklin Delano Roosevelt. 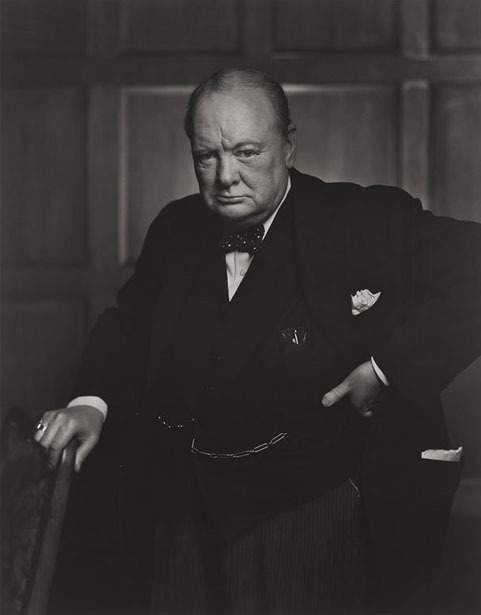 King asked Karsh if he would photograph Churchill during the Canadian visit, and Karsh agreed. 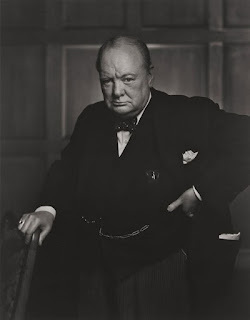 To prepare, Karsh practiced with a subject similar in stature to Churchill from the waist down. He set up his equipment in the speaker’s chamber in the Canadian House of Parliament, a huge Tudor apartment that was used for the speaker to entertain guests. Wrangling hundreds of pounds of photography equipment, Karsh next waited patiently for the moment when Churchill would finish his speech and exit the House of Commons and enter the speaker’s chamber. On the tail of his impassioned speech, Churchill came striding into the chamber, arms outstretch, hands open: in one, somebody placed a glass of brandy, in the other, a Havana cigar. It took a moment, but Churchill soon noticed the small, young photographer standing amid his mass of equipment. “What’s this? What’s this?” Churchill demanded. Churchill relinquished his glass to an assistant and began to sit for the photograph, still puffing on his cigar. Karsh readied the equipment but, just before taking the picture, he placed an ashtray in front of Churchill, asking that the prime minister remove the cigar from his mouth. Churchill obstinately refused, and Karsh was perplexed: the smoke from the cigar would certainly obscure the image. He returned to the camera, ready to take the picture — but then with lightening speed, Karsh leaned over the camera and plucked the cigar from Churchill’s lips. “He looked so belligerent, he could have devoured me,” Karsh would remember later, and it’s a belligerence that comes across in the famous photograph — a scowl over the pilfered cigar that came to represent, seemingly, a fierce glare as if confronting the enemy. When completed in 1859, it was, says clockmaker Ian Westworth, “the prince of timekeepers: the biggest, most accurate four-faced striking and chiming clock in the world.” 30 January 1965: The bells were silenced during the funeral of statesman and former prime minister Winston Churchill. The tower had its 150th anniversary on 31 May 2009, during which celebratory events took place. On 21 August 2017, the tower began a four-year period of renovation. With a few exceptions, the tower's renowned bells will be silent until the renovation is complete. Elizabeth Tower, previously called the Clock Tower but more popularly known as Big Ben, was raised as a part of Charles Barry's design for a new palace, after the old Palace of Westminster was largely destroyed by fire on the night of 16 October 1834. The new parliament was built in a neo-gothic style. Although Barry was the chief architect of the palace, he turned to Augustus Pugin for the design of the clock tower, which resembles earlier Pugin designs, including one for Scarisbrick Hall in Lancashire. The design for the tower was Pugin's last design before his final descent into madness and death, and Pugin himself wrote, at the time of Barry's last visit to him to collect the drawings: "I never worked so hard in my life for Mr Barry for tomorrow I render all the designs for finishing his bell tower & it is beautiful." The tower is designed in Pugin's celebrated Gothic Revival style, and is 315 feet (96.0 m) high. In August, 2017, satirical news site The Rochdale Herald published a spoof article stating that the bell was to be renamed "Massive Mohammed". Many people mistook this for a genuine news story and were widely ridiculed on Social Media. This even inspired the creation of two online petitions. Its name, which is derived from the neighbouring Westminster Abbey, may refer to either of two structures: the Old Palace, a medieval building complex destroyed by fire in 1834, and its replacement, the New Palace that stands today. The palace is owned by the monarch in right of the Crown and for ceremonial purposes, retains its original status as a royal residence. The building is managed by committees appointed by both houses, which report to the Speaker of the House of Commons and the Lord Speaker. The subsequent competition for the reconstruction of the Palace was won by the architect Charles Barry, whose design was for new buildings in the Gothic Revival style, specifically inspired by the English Perpendicular Gothic style of the 14th–16th centuries. The remains of the Old Palace (except the detached Jewel Tower) were incorporated into its much larger replacement, which contains over 1,100 rooms organised symmetrically around two series of courtyards and has a floor area of 112,476 m2 (1,210,680 sq ft). Part of the New Palace's area of 3.24 hectares (8 acres) was reclaimed from the Thames, which is the setting of its nearly 300-metre long (980 ft) façade, called the River Front. Barry was assisted by Augustus Pugin, a leading authority on Gothic architecture and style, who designed the interior of the Palace. Construction started in 1840 and lasted for 30 years, suffering great delays and cost overruns, as well as the death of both leading architects; works for the interior decoration continued intermittently well into the 20th century. Major conservation work has been carried out since then to reverse the effects of London's air pollution, and extensive repairs took place after the Second World War, including the reconstruction of the Commons Chamber following its bombing in 1941. The words are taken from Vergilius Aeneid, the 6th song, verse 663: "Lo, God-loved poets, men who spake things worthy Phoebus' heart; and they who bettered life on earth by new-found mastery". The name of the Leaureate is engraved on the plate below the figures, and the text "ACAD. SUEC." stands for the the Swedish Academy. The Nobel Prize Medal for Literature was designed by Erik Lindberg. It is located on the territory of Blenheim Palace, built in honor of the victory of the British Army led by the first Duke of Marlborough over the French at Blenheim in 1704 In 1991 the palace completed the green labyrinth of yew. Tracks Marlborough maze are added into the picture, reminiscent of the battlefield with the scorching guns, waving flags and trumpets. Here there is also a sign of «V», symbolizing victory. However, some argue that it is in honor of Winston Churchill, who was born in the palace. Figure divergent rays from the center - a circular area with an inscription "Blenheim" - in honor of the great victory. Designed in the rare, and short-lived, English Baroque style, architectural appreciation of the palace is as divided today as it was in the 1720s. It is unique in its combined use as a family home, mausoleum and national monument. The palace is also notable as the birthplace and ancestral home of Sir Winston Churchill. Following the palace's completion, it became the home of the Churchill, later Spencer-Churchill, family for the next 300 years, and various members of the family have wrought changes to the interiors, park and gardens. At the end of the 19th century, the palace was saved from ruin by funds gained from the 9th Duke of Marlborough's marriage to American railroad heiress Consuelo Vanderbilt. The exterior of the palace remains in good repair.